Instead of manipulating your laptop’s mouse (in the case of your laptop you might be using your built-in touchpad or a wireless mouse) with your hand, you can use your keyboard to move the cursor. In the Start menu, click Settings → Ease of Access and then click Mouse in the left pane. To use the numeric keypad to move your mouse cursor on your screen, click to turn On the toggle setting labeled Use Numeric Keypad to Move Mouse Around the Screen. To control the speed at which the cursor moves on the screen, turn on the Hold Down Ctrl to Speed Up and Shift to Slow Down toggle settings. If you’re left-handed, in the Start menu click Settings → Devices → Mouse & Touchpad. In the resulting dialog box, click the Select Your Primary Button drop-down menu and then click to select Right. This setting makes the right mouse button handle all the usual left-button functions, such as clicking and dragging, and the left button handle the typical right-hand functions, such as displaying shortcut menus. This helps left-handed people use the mouse more easily. 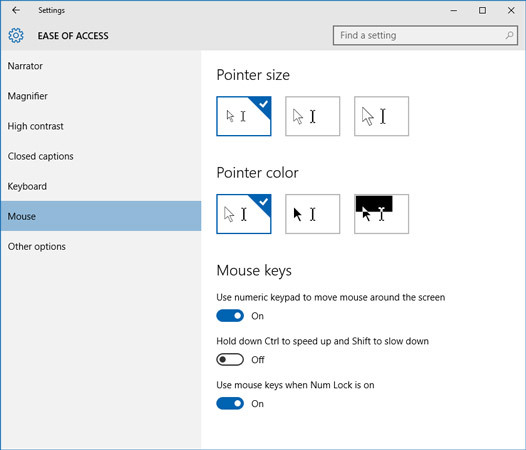 If you want to modify the behavior of the mouse pointer, in the Start menu click Settings →Devices → Mouse & Touchpad and then scroll down and click Additional Mouse Options. In the resulting Mouse Properties dialog box, click the Pointer Options tab to set the pointer speed (how quickly you can drag the mouse pointer around your screen), activate the Snap To feature that automatically moves the mouse cursor to the default choice in a dialog box, or modify the little trails that appear when you drag the pointer. If your touchpad isn’t working well for you, consider buying a wireless mouse, similar to the one you use with your desktop computer. You simply plug a receiver into a USB port on your laptop, and the mouse is activated. When using a standard mouse you might want to invest in a mouse pad with a wrist rest to reduce strain that can lead to carpal tunnel syndrome.